These 11 Ableton tips and tricks are often overlooked, yet extremely useful. Some of these ableton tips are interesting production techniques and others are features which can save you some time and speed up your workflow. Keep in mind that this is an Intermediate guide, so if you are new to Ableton Live, this may be difficult to understand. Note: If you’re using Mac, “Ctrl” = “Command” for all keyboard shortcuts. Ableton’s delays offer 3 different modes which change the delay’s processing behavior. The “Repitch” mode can be used to simulate a tape stop effect. 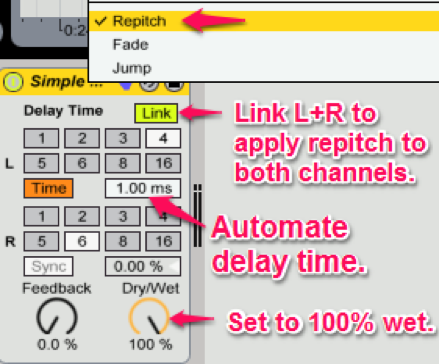 To change the delay mode, right-click on the delays title-bar and select “Repitch”. This works with Ableton’s Filter Delay, Ping Pong Delay and Simple Delay. I’ll use Simple Delay to demonstrate. You can get some interesting results when trying this with the other delays too. To hear this effect, the “delay time” needs to be automated. When the delay time is static, we won’t hear any difference, but when the delay time is being changed, while a sound is going through the delay, we will hear a pitch increase or decrease. The cool thing about this is that when the delay time isn’t being changed/automated, the pitch of the sound will glide back to it’s regular original pitch. To create a tape-stop effect, the delay time needs to be automated from a low to high value. It’s possible to create a pitch increase when automating the delay time from a high to low value. Keep in mind that the pitch change only happens when the delay time is being changed/automated while processing a sound. Note: The entire channel will be delayed by the value of the delay time when it is static. It’s important to keep the delay time at 1.00 ms when this effect isn’t being used. Alternatively, use feature #10 to turn the delay off when it’s not being used. Freezing a channel in Ableton is a great way to save CPU and is also useful to quickly bounce MIDI channels into audio, by “flattening” a frozen track. The only problem with “flattening” is that it overrides your original MIDI track with audio and it also gets rid of all the effects you have on that channel, as they will be baked into the frozen audio file. What if you want to keep the frozen track with your MIDI clip and effect chain? Highlight the area of the frozen track you want the audio from. Hold down “ctrl” click + drag the clip into an audio track. You will now have an audio copy while the frozen track remains the same. Do you ever have a long audio clip, but only want to audition certain parts of it to find which section sounds best? Here’s a great way to “scroll” through an audio clip by using a clip of silence as a placeholder. Create a clip of silence or “place holder” by using any audio sample and turning it’s gain down to “-inf dB” in the sample editor. Put the placeholder after the audio clip you want to scroll through. This placeholder prevents the audio clip from expanding when dragging the start marker forward. Double-Click on the title bar of the audio clip to open the sample editor. 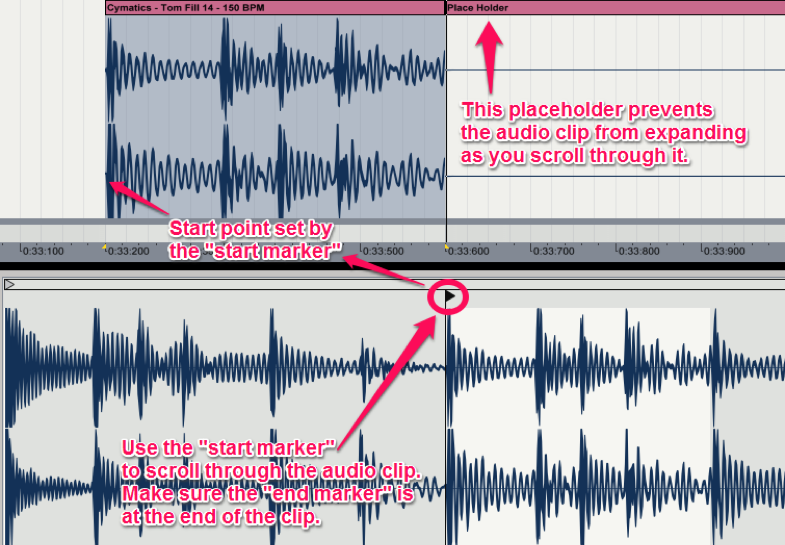 Drag the “end marker” to the end of the audio clip. Drag the “start marker” back/forth to scroll through the audio clip. This allows you to quickly listen through different parts of the clip and find which part works best. When you are done, you can delete the placeholder. Ableton comes with a large selection of “Max For Live” plug-ins, one of which, is the convolution reverb. This type of reverb works by processing a recorded sample called an “impulse response” or “IR” and uses the acoustic reverberant behaviours unique to it’s space. The cool thing is that we aren’t limited to using a regular IR which is usually just some sort of impact or “impulse” sound, that was recorded in a certain environment. It is possible to use percussion loops or foley recordings as an IR as well. This will yield interesting rhythmical reverb tails. To do this, simply drag any percussion loop or foley sample into the convolution reverbs IR display, as shown in the picture below. The transients in the percussion loop will act as new impulses and the reverb will now have a rhythmical tail. Note: Use percussion loops that are at the same bpm as your project if you want the rhythmical reverb to be in sync. Sometimes you might want to copy-paste or drag an audio/MIDI clip or section of your project without copying the automation. Using the “Lock Envelopes” feature is a great way to move anything around while the automation stays locked in it’s place. Automation can be a headache to work with. Here are a few keyboard hotkeys you can use to make things easier. 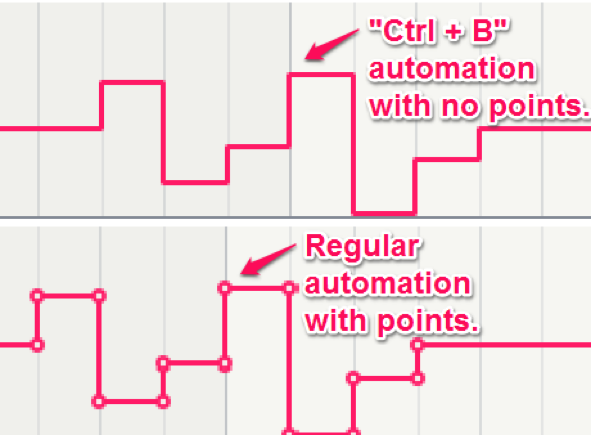 Snap to vertical axis: Hold down “Ctrl” while dragging an automation point up or down and it will only move vertically. This also allows you to move the automation point at a finer value. Drag through automation points to delete them: Simply click & hold an automation point while holding “Shift” and drag it through other automation points to delete them. If you move the opposite direction while still holding shift, the automation points that were deleted will reappear at their original position. Delete a highlighted section of automation: Highlight a section of automation and press “Ctrl + Delete.” This deletes the automation only, without deleting the contents of the audio/MIDI clip. Draw-in quantized automation: Press “Ctrl + B”, to use the “Draw Tool.” This allows you to draw blocks of automation, according to the size of the grid. Press “Ctrl + B” again, to exit out of draw mode. The automation points will re-appear. Writing chords and melodies doesn’t have to be difficult, but with so many notes to chose from it can become overwhelming. 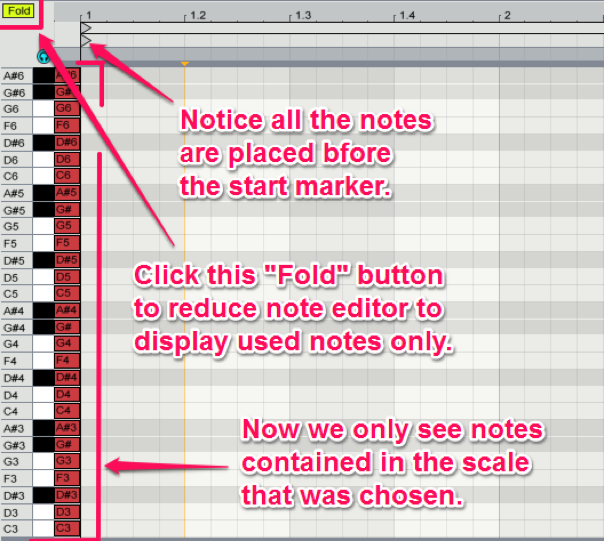 A way to make this easier is to pick a scale and “fold” the note editor to that scale. 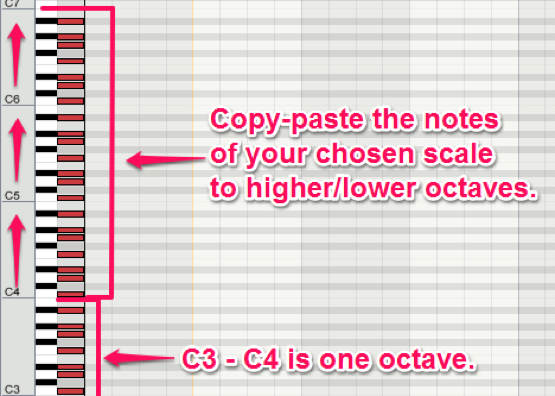 The note editor will now only display the notes in that scale and any note you choose will be harmonically correct. For this demonstration, let’s use a C minor scale. Draw in all the notes within the scale you are using and copy them to higher/lower octaves. At the top-left corner of the note editor is a little “Fold” button. Clicking this will reduce the note editor to only notes that are being used. In this case, it will fold down to display only the notes in the C minor scale. Note: Create the scale of notes before the start maker. This way they won’t all play out in your MIDI clip. Alternatively, you can highlight all the notes and press “0” to mute them. Have you ever wanted to compare two tracks without having to “solo” them back and forth? 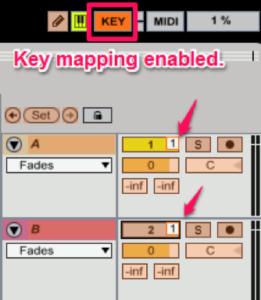 Using Ableton’s key mapping feature is a great way to quickly A/B two tracks. Key mapping allows you to map keys from your computer's keyboard to toggle parameters on & off. For this demonstration, let’s use Ableton’s key mapping to switch between two channels at the press of one button. When we press our mapped key, one channel will activate while the other channel simultaneously deactivates. Next, press “Ctrl + K” to enable key mapping. You’ll notice that a lot of parameters become highlighted when you do this. Alternatively you can click the “KEY” button as shown below. Anything that is highlighted orange can now be mapped to a key on your computer’s keyboard. Simply click on a parameter and press the key you’d like to map to that parameter. In this case, let's map the number “1” key to toggle these two tracks on and off. One of the channels was off to begin with, so it will toggle on as the other one toggles off whenever pressing the number “1” on the keyboard. Keep in mind that you can choose any key to map to these parameters. For this example the number “1” was used but that doesn't make any difference at all. Press “Ctrl + K” to disable key mapping mode. Now you can use the mapped key to seamlessly A/B between two channels at the press of a button. 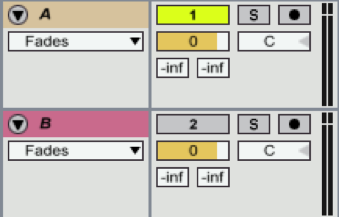 In Ableton, it is possible to create “Audio Racks” of effects. These racks offer some great features, one of which is the chain selector. The chain selector makes it possible to morph between different effect chains at the turn of one knob. Click the chain list icon to open the chain list display. To see the chain range, click the “Chain” button, to the left of the “Hide” button. Drag the thin “cross-fader” bars to the opposite ends to create the fade. Map the orange chain selector ruler to any macro. This will be the macro you automate to morph between the two effect chains. You can save this empty rack as a default morph rack. This is a great way to crossfade between different effect racks. It is also possible to create more chains and set the blue bars to cover specific ranges, allowing you to morph between several effects chains. Ableton Tip #10. Save CPU by deactivating effects that are not in use. Limited CPU availability can be a huge setback when working on big projects. Freezing tracks is one way to reduce CPU usage. Here’s another trick you can use. Often times there will be many audio effect plugins that are turned on, but aren't processing audio. All of these effects are still using up CPU in the background. It would make sense to have them automatically disable, when they aren’t being used. Keep in mind, this may not be applicable to all effects but it’s still a great trick to start using. Let’s say we have are using Ableton’s Autofilter, but it’s only being used for low-pass filter automation. It is possible to setup the filter so that when the cutoff is all the way up, the filter is turned off, but as soon as the cutoff is automated below it’s full value, the filter turns on. Map both ON/OFF and the filter frequency cutoff to the same macro. In this case they are both mapped to macro 1. Set the “Device On” Min value to 127. This means that when the macro is at it’s full value and the filter frequency cutoff is all the way up, the filter will turn off. Set the “Device On” Max value to 126. This means that when the macro reaches a value of 126 or below, the auto filter will be turn on. If the macro knob is being automated, it is easy to turn the filter off by simply setting the automation value to 127. Some samples don’t start right at the main transient. For example, the clap in the picture above contains a transient lead-up. Trying to line-up this main transient with the grid can be time consuming, so here’s a way to make it easier. Highlight the area before the main transient. Use “Ctrl” for fine (not snapped to the grid) highlights. The status bar at the bottom tells us a few things about the highlighted area. What we want to know is the duration. In this case the highlighted area (transient lead-up) is 172 ms long. Click on the “Track Delays” icon at the bottom right hand corner to display the track’s delay settings. Set the track delay time to -(value of transient lead-up duration). In this case, it is set to -172 ms.
By setting the track delay to -172 ms, we can place the clap sample right on a beat, without trying to line up the main transient with the beat. Since the track plays 172 ms earlier, the transient will now line-up with the beat. Thanks for reading this blog! I hope these 11 Ableton Features will help improve your sound design and/or workflow efficiency. It can take some time to develop the habit of using these features instinctively, though these shortcuts will help you out in the long-run and make music production more enjoyable! Do you have any tips you want to share? Comment Below and let us know!